My plan to have a nap before hiking Mount Merapi failed miserably. After getting back later than expected from a day of sightseeing, I was running late. I barely had time to grab snacks and a shower before the car pulled up outside just before 10pm. I’ve only been in Indonesia for less than 24 hours and most people would, sensibly, opt for a good night’s sleep. However, it’s not every day you get the chance to climb a volcano. Let alone the most active one in the country teeming with them. 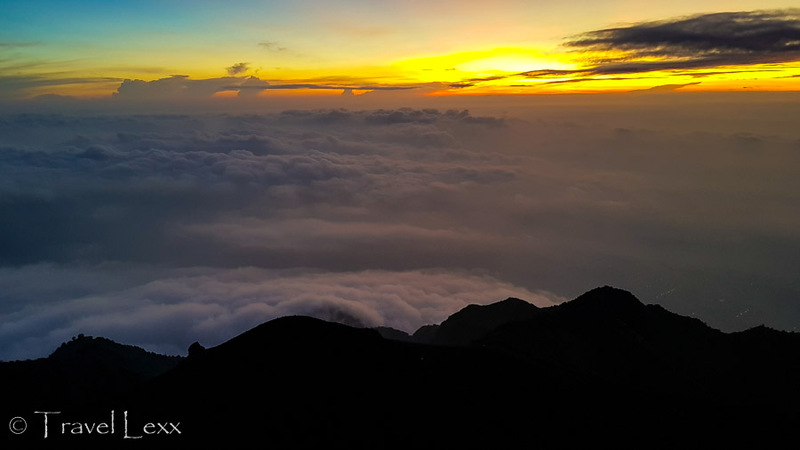 Here’s everything you need to know about hiking to the summit of Mount Merapi. Mount Merapi is the most active volcano in the whole of Indonesia and frequently lives up to its name. In fact, its latest eruption was on the 11th May 2018, just three weeks after I stood at the top. Translated loosely as “Fire Mountain”, it’s a pretty accurate way to describe the volcano that’s been erupting since the 16th century. The reason? The Pacific Ring of Fire – a giant belt of tectonic activity in the Pacific Ocean. It contains over 75% of the world’s volcanoes and around 90% of the world’s earthquakes occur along its length! And it happens to pass under much of Indonesia making the volcanoes here particularly lively. Climbing one of them was high on my list of priorities! There are a number of ways you can hike Mt. Merapi. The easiest option, and one I went for, is to join a tour. There are a few companies running tours from Yogyakarta and your accommodation can usually help in booking you a place. One thing to bear in mind is that most Merapi tours are for a minimum of two people. If you are a solo traveller, you need to see if there are already people doing the tour on your chosen date. Alternatively, you can always persuade someone else to go or, if all fails, pay for two places. 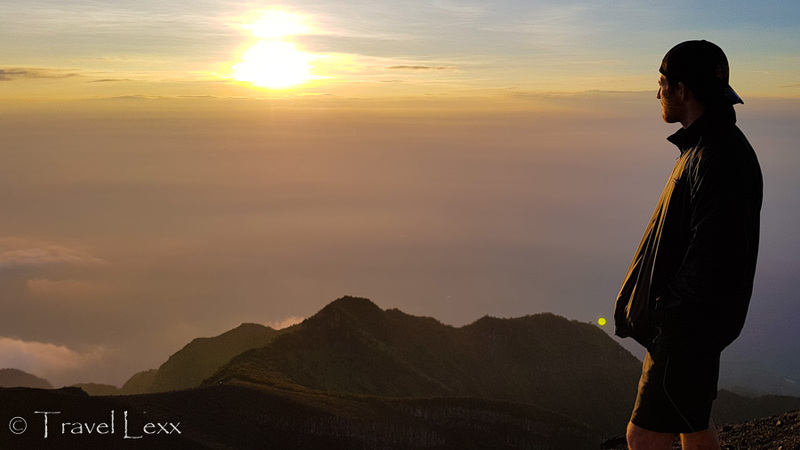 I went with Kresna Tour Jogja who offer a full Merapi hiking package, including pick up and drop off to Yogyakarta, guides, breakfast, water and headlamp. 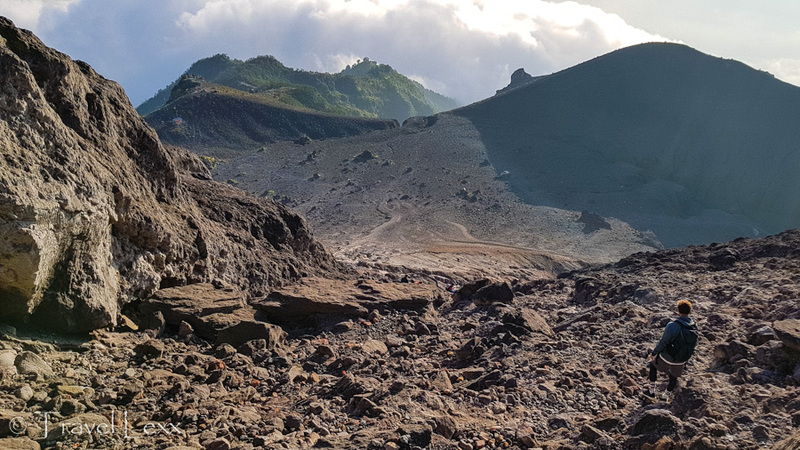 It IS possible to hike Mount Merapi without a tour as you don’t technically need a guide. You can rent scooters in Yogyakarta or get a car. Public transport to Selo is not reliable so I would recommend setting arriving around 11pm-midnight by car or much earlier by bike (to avoid riding the winding roads in the darkness). The other option is to stay in one of the guesthouses nearby. I usually avoid organised hiking tours but after doing my research, the logistics would not have worked for me in the time I had available. It was a long and winding drive to Selo village, a sort of base camp for Mount Merapi hikes. Selo has a number of guesthouses, tour companies and cafes but we didn’t get a good look around in the darkness. We arrived at Ratri Guesthouse around 00:30 and were promptly served hot tea and coffee as a pre-hike pick-me-up. The courtyard was shielded from the elements and there were western toilets available. It’s possible that Kresna Tour Jogja could help you organise accommodation in case you wanted to get some sleep before the hike. We filled in forms confirming we won’t sue the company if the volcano explodes (or something) and checked our equipment. As the entire hike up takes place in the dark, headlamps are available to borrow. It takes an average of four hours to get to the summit, in time for sunrise. Tackling the hike during the day is possible but not recommended due to extreme temperatures. Our group set off around 1am. The first kilometre was just an uphill paved road with houses on either side. After a short break at an outpost, we started on the trail proper. While it’s not a technical hike, it is very steep in places. There aren’t many flat sections so you are heading up almost all the time. My fitness levels are pretty high but the hike was definitely tougher than I expected. Maybe spending the entire day sightseeing on foot before the hike may not have been the best idea! The path goes over different kinds of terrain with rocks, softer ground and loose gravel keeping you on your toes. There was a bit of rain as we were heading up making the ground slippery in places. I would definitely recommend a good pair of hiking shoes! There are a few rest stations along the climb where you can pause to drink water or have a snack. It’s also an opportunity for those lagging behind to catch up with the front of the group. The guides know exactly how long the hike takes and time all breaks so that you make it up for sunrise. Climb and rest was the pattern for the next few hours until we had a longer break by a huge rock. The guides disappeared into the trees and came back with sticks as we collectively tried to start a camp fire. The earlier rain didn’t help matters and we used every trick in the book (including a pack of Powerpuff Girls tissues someone in the group – categorically not me – brought with them). Eventually it worked and we sat and watched the flames dance across the small clearing for a while. The extended break proved to be a blessing as the next climb was one of the toughest. A slope of volcanic ash and loose rocks awaited and this is where your legs are really likely to burn. Our feet sank into the ground making progress slow and tough. Thankfully the end, and the summit, are in sight. After another, less tiring, climb we made it to the top! 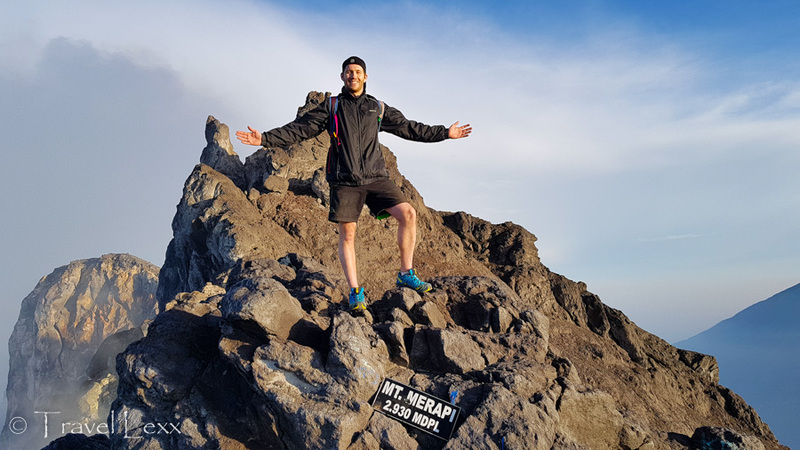 Mt Merapi peak currently stands at 2930 metres above sea level. I say currently, because the height can change following eruptions! The sun was still behind the horizon so we relaxed, drank water and patted each other on the back. Soon the sun started to come up and we were treated to some incredible views. It was pretty surreal. The sun rose above the clouds far below us on one side and steam bellowed from the volcano crater on the other. I wandered along the rim but the drop on either side was significant. After taking a few steps away from the little shelter I had to turn back. We spent a while just watching the sun making its way above the horizon and taking in the views. To the left of us, the peak of Mt. Merbabu framed the scene perfectly. We made our way through our remaining snacks – except one guy’s cheese crackers which hilariously no one wanted to try. We posed for photos with a sign stating that we were 2930 metres above sea level. Now came the easy part, right? Wrong. I am not a fan of descents at the best of times. It’s hard on your knees and I do find it much easier to go up than down. Our weary legs didn’t help and there were plenty of slips and falls. The ash section was much easier though as we raced down, filling our shoes with small rocks. 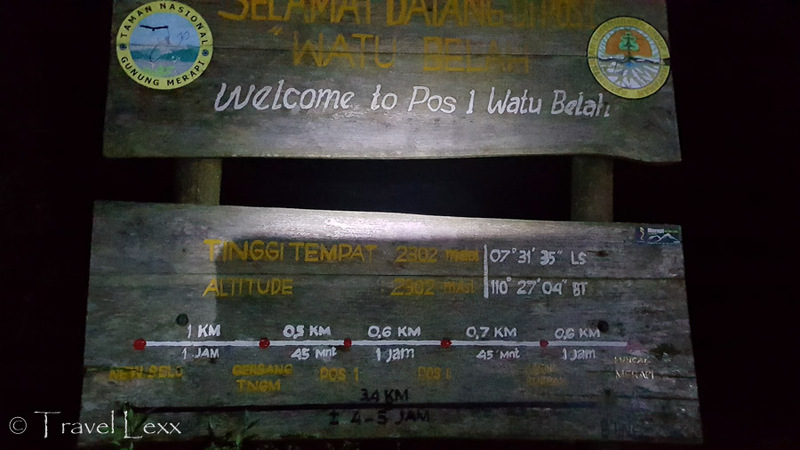 We reached Pasar Bubrah, a plateau where a lot of the overnight hikers choose to camp before reaching the top. 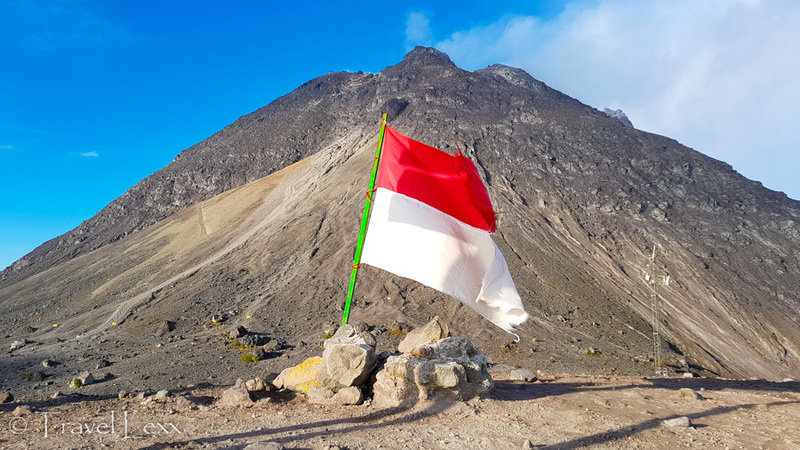 The Indonesian flag flowed in the wind with Merapi peak in the background. Going down at least lets you appreciate the views – as on the way up it’s pitch black throughout! The going was getting slower as coupled with our tiredness the path was steep and hard on the knees. Make sure you take every opportunity to hold on to something when descending. Tree trunks, rocks on the side of the trail – anything to help you keep your balance. Going down is tough in places so DO NOT RUSH. 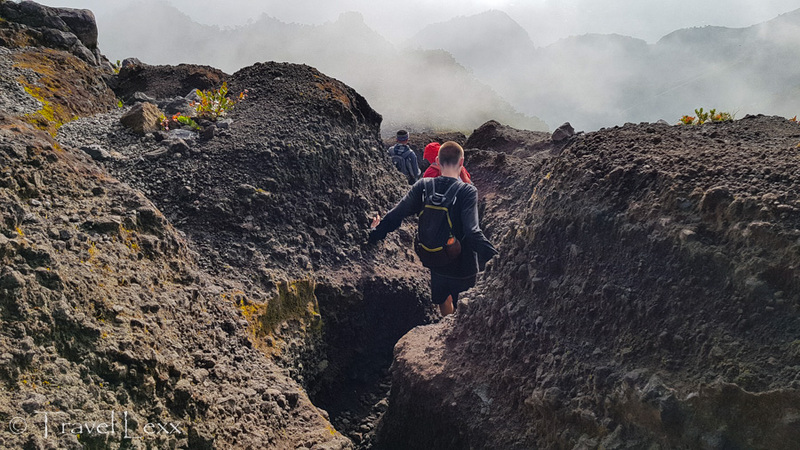 The descent can take as long as the ascent on Merapi. There are plenty of breaks throughout though. Eventually, we reached the outpost at the top of the paved road. Exhausted, sweaty, dusty – we were a sight to behold for sure. We slumped at the wooden tables as our legs almost gave way. There are drinks and snacks available to buy if you’ve run out. Luckily, we didn’t have to head down the steep paved road. That may have been too much our bodies. The guides brought a van up the hill and we all piled in for the short journey down. In true South East Asia fashion, the guides hopped in the boot of the van and held on to the backs of the seats all the way down. Looking at this photo still makes me laugh! And then we were back at base camp. After over eight hours spent on the mountain, we tucked into breakfast pancakes, tea and coffee. The sun was high in the sky by now and we all thought back to a few hours ago when its orange light was just peering over the horizon and giving us some unforgettable views. All pain was forgotten – the challenge of climbing the mountain was worth every single scrape in the end. 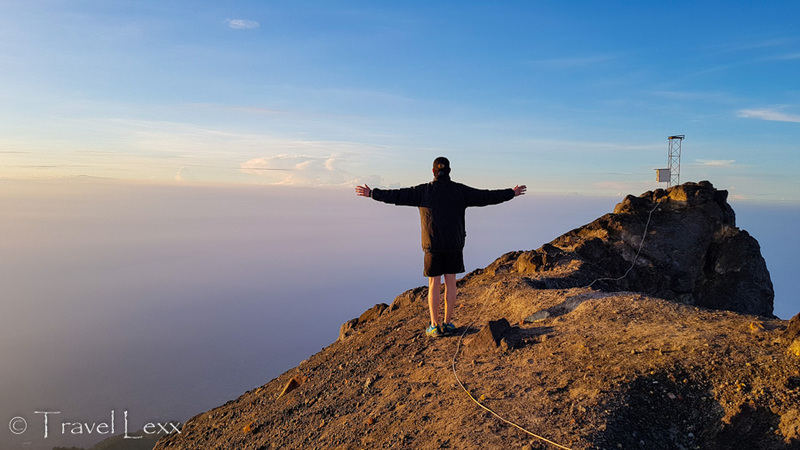 Hiking Mount Merapi is an awesome adventure that you should definitely put on your travel bucket list. Maybe not when it’s erupting though. I did kinda cut it fine this time! 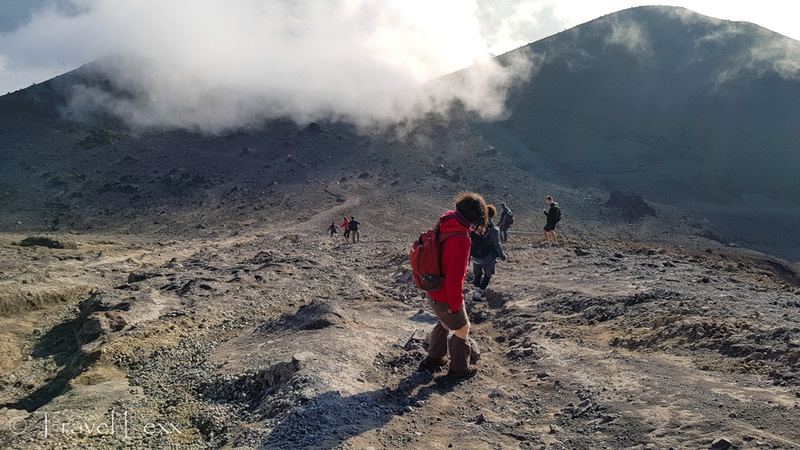 Have you climbed an active volcano before? Would it put you off? Let me know in the comments! #1 Mt Merapi is the most active volcano in Indonesia and has been erupting regularly since 1548. #2 Mt Merapi is one of 16 “Decade Volcanoes” around the world. These are considered to be worth of special attention by scientists due to their history of large disruptions and proximity to populated areas. #4 It currently stands at 2930 metres after a 2010 eruption shaved almost 40 metres off its height. #5 The volcano last erupted in May 2018 forcing locals to evacuate and even shutting the international airport in Yogyakarta. 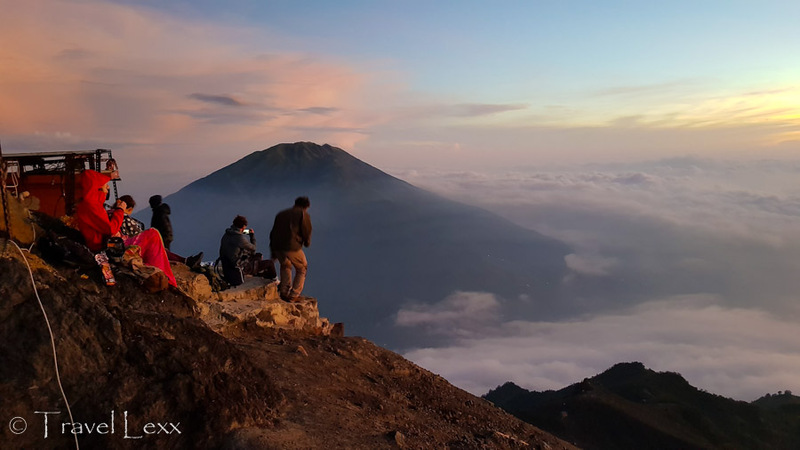 Length: The total length of the hike – from the bottom of the paved road in Selo to the Merapi summit and back is around 9km. How to get there: Organised tour with Kresna Tour Jogja. Alternatively you can hire your own transport to get to Selo. Notes: The hike is very steep and tough in places. Can be slippery. Be extra careful during the descent as injuries are more likely to occur here. At least a moderate level of fitness is required. 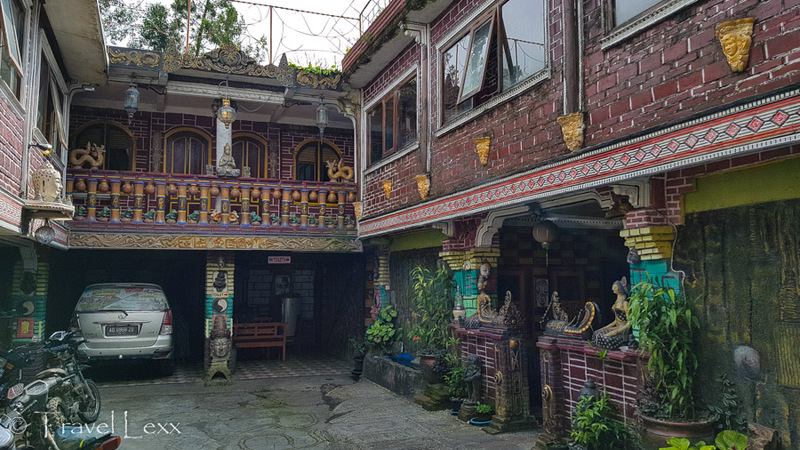 Accommodation: I stayed at the amazing Ostic House in Yogyakarta – seriously look these guys up, the place is amazing. Dorms from 100,000 IDR (£5/6.70) including breakfast. The friendly staff can you help you book the hiking tour and will even prepare a packed breakfast to take with you! One of the best hostels I’ve stayed in in South East Asia! t’s also possible to stay in Selo – the hike started at Ratri Homestay which has cheap rooms. Hiking or running shoes – the more grip, the more comfortable you will be! Spare t-shirt – you’ll definitely want to change into a fresh shirt after the hike. Water – there is no water anywhere on the trail so bring enough for the entire hike. Headlamp/flashlight – the guides will normally hand these out but it’s good to travel with your own. 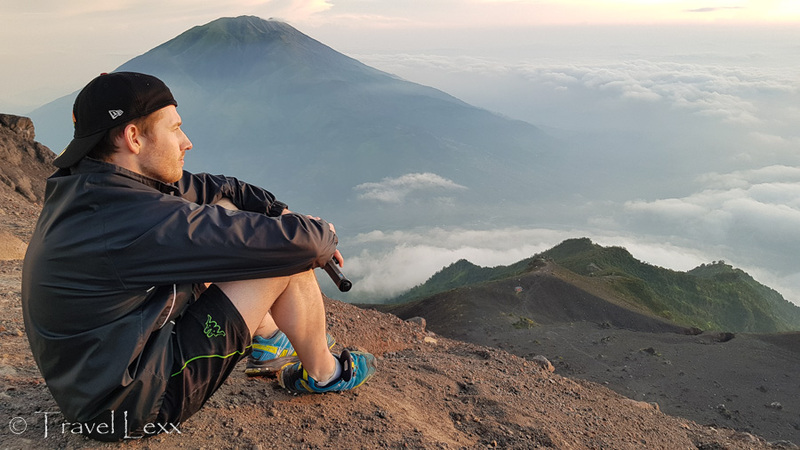 This entry was posted in Indonesia and tagged active, Asia, Gunung Merapi, hiking, Indonesia, Java, Mount Merapi, Mt Merapi, trekking, volcano. It’s a beautiful country and really has something for everyone – such a cliche, I know! You will love it! Mt. Merapi sounds like an exhilarating hike. I think I too would stay nearby on the night before the hike. The liability form makes it sound like a very active volcano site. I must say that I have been on active volcanoes before without giving too much thought. My kids used to ski on Mt Ruapehu (an active volcano in New Zealand that has erupted several times over the last 10 years). On one trip, the family noted that there was steam coming from underneath the snow and the top of the ski field had a “sulphur” smell. I know all about sulphur and the smell after climbing Ijen on this trip! That was spectacular. Ah New Zealand sounds amazing and I really want to explore its nature. Yeah I don’t tend to think too much of things like that when I hike – but it’s always important to take necessary precautions! It was more challenging than I expected but myself and a couple of others were hiking very fast. You can definitely take your time and go at your own pace. Most people make it up in plenty of time for the sunrise! Wow that sounds like an amazing experience. I don’t know how you did it without a nap and after sightseeing all day. It definitely sounds like an organized tour is the best option for the hike but its annoying they charge extra if you are on your own. #TheWeeklyPostcard. Yeah I ended up having 10 hours sleep total in 4 days so I repeated this cycle a couple more times. That’s how I travel I guess! Yeah it’s ok if you can find others but I was surprised that on some days they don’t have even two people doing it! We did Ijen too on this trip and managed to see the blue fire! They closed the trail until 4 am due to an incident a while ago so it’s very tough to see the blue fire but we ran up and into the crater and made it! Batur was awesome too! Glad you liked it! I was on Mount Merapi at the beginning of April. I had no idea it erupted only a week of so ago. Wow! We didn’t climb it (my kids would have started a rebellion) but took a jeep ride to a bunch of viewing points, including a museum that housed the left over artifacts of the major 2010 eruption that killed hundreds of people. This jeep tour was bizarre, almost Disney like. Your hike sounded amazing and beautiful. I love the photos! 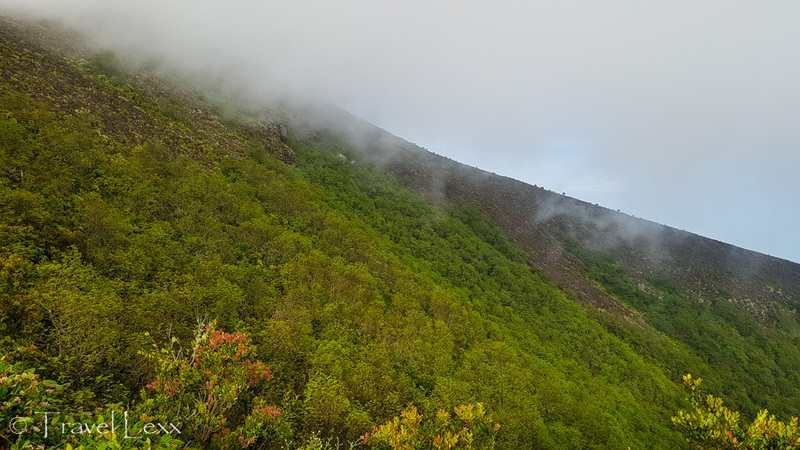 We hiked the dormant volcano Kelimutu on Flores in March. Not as hard as yours, but certainly stunningly beautiful as well! Yeah I was certainly not expecting to cut it this fine! Ah, I’ve read about the museum – it would be very interesting to see it! I still need to make it to Flores so I am thinking about going back to Indonesia. There’s Rinjani too! So many volcanoes…Thanks for stopping by! It was great fun – challenging hike too which I was happy about. It was a great workout and being at the top was amazing. Glad it wasn’t erupting at the time though! Sounds like a great experience, and it is great that you can do the hike in a day. I would probably also do it with a guide for both logistical and safety reasons! Yeah, it just made everything a lot easier and just allowed me to focus on the experience! I’ve never climbed an active volcano before: only done flying over the Kīlauea in Hawaii, which was soooooooo awesome! And also some lava field hikes in Iceland and Canary Islands. But this is definitely something I´d be excited to experience! Those pre-sunrise views look magical! Hawaii looks absolutely incredible and is definitely somewhere I need to visit. Heard really good things about the Canary Islands away from the beach crowds! What an adventure! Your post is so helpful. I’m impressed that you included lodging info and a list of what to pack. The views from the summit are stunning! Thanks Sharon – yeah I just wanted to post something that people would find useful as when I was researching it I had to look at many different websites! That sounds like quite an experience. We were going to do the Ijen hike the last time we were in Indonesia but had to cancel because of time constraints. 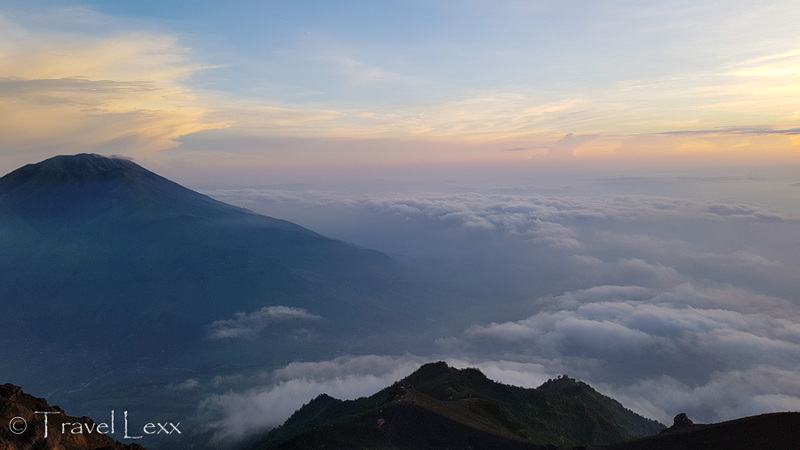 Ah that’s a shame – Ijen is definitely worth it. I will have a post on it soon so keep an eye out! Superb mate! I remember chatting with you before and after the hike, torn between jealous and relieved that I didnt get to hike Merapi when I was in Yogya. Views definitely seem worth getting up there, but climbing up in the dark can’t be safe. Most crazy though is you doing all this on no sleep! Ha what is this sleep thing you mention? It definitely was an adventure! And how cool is Yogya, right? The best views always do take a little work and risk, right? Sounds like an awesome hike. You’ve got me curious about the Blue Fire on Ijen though. Sounds intriguing! Thanks – it was definitely an adventure! And I will be writing about Ijen soon! It was a pretty special experience! Maybe when your kids are older, it could be a great family trip! Awesome pictures, looks like one heck of an adventure. Not sure I could make it up that far, but the view had to have been tremendous. It was a pretty tough hike but it was definitely worth the effort!